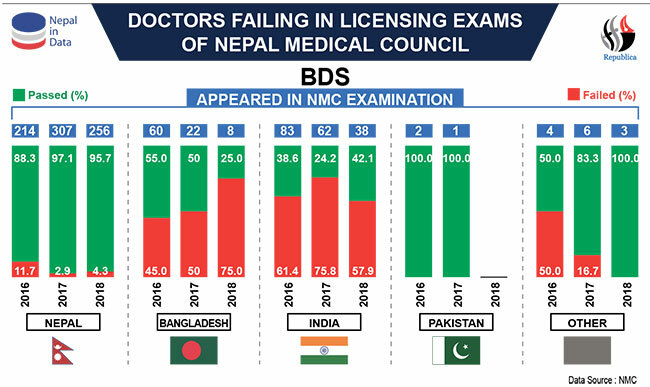 KATHMANDU, Sept 7: The number of doctors failing in the licensing exam administered by the Nepal Medical Council (NMC) is higher among those who studied in China, Russia, Kyrgyzstan, Ukraine and the Philippines. The pass rate for medical students who studied in Nepal is higher in comparison to those studying in various other countries. According to NMC, a total of 592 postgraduate doctors took the licensing exam in 2016 but 212 failed. 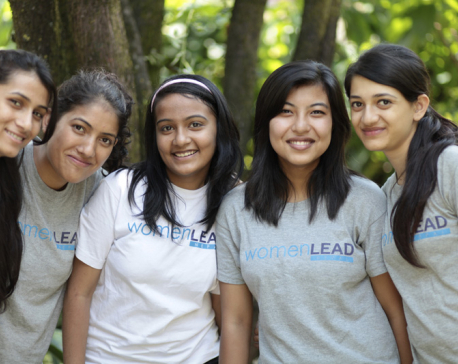 Passing the test makes one eligible for practicing medicine in Nepal. A total of 1,481 postgraduate candidates appeared for the exam in 2017 and 520 failed. Similarly, 687 postgraduate doctors sat for the exam in 2018 and 266 failed. Since 2016, altogether 40 postgraduate doctors who studied in Kyrgyzstan have appeared in the NMC licensing exam. Of them, only nine have passed. Similarly, 46 MBBS doctors who studied in Kyrgyzstan took the test and only eight passed. Similarly, a total of 3,309 MBBS doctors appeared in the licensing exam in 2016 and 1,105 failed. In 2017 a total of 2,038 MBBS candidates took the exam and 855 failed. In 2018 altogether 1,650 candidates sat for the exam and 424 failed. Those who fail once can sit for the exam repeatedly. There is no limit on the number of times. Likewise, 363 BDS doctors sat for the licensing exam in 2016 and 105 failed. A total of 399 BDS doctors appeared in the exam in 2017 and 68 failed; 305 BDS docs appeared in 2018 and 39 failed. NMC officials said that the highest numbers of doctors failing the licensing exam are those who studied in China, Russia, Kyrgyzstan, Ukraine and the Philippines. Similarly, those who studied Bachelors in Dental Surgery (BDS) in India failed the licensing exam in the last three years. Dr Dilip Sharma, registrar at NMC, said that students who could afford to study medicine abroad although they had less marks are the ones who tend to fail the licensing exam. “Our test questions are standard and doctors who completed their studies but did not undergo proper internship fail the licensing exam,” he said. At the same time, foreign universities allow Nepali students to pass even though their performance is not good since they think that these students will be returning to Nepal to practice their medicine, said some doctors requesting anonymity. Students who went to study medicine abroad before 2016 failed the NMC exam as an eligibility test prior to going abroad was not mandatory then, said Dr Sharma. “Higher number of doctors will pass the exam after 2022 as students who went after 2016 will start returning in 2021 after completing their five-year course,” he added. 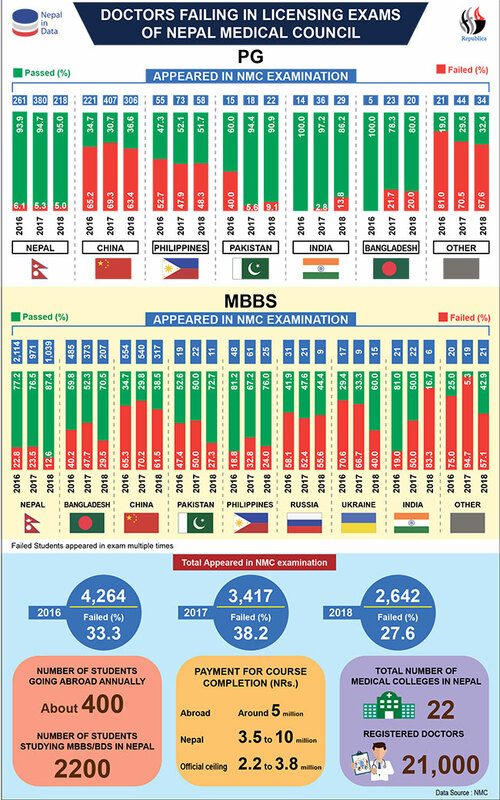 The number of students going abroad to study medicine decreased after NMC enforced a rule in February 2016 requiring students to pass an entrance exam before studying medicine in foreign universities. Figures provided by NMC show that over 300 students were given eligibility certificates in 2016 for studying medicine abroad at undergraduate and postgraduate levels. At present, the number of medical students going abroad annually hovers around 400. Students must pass the merit test administered by the Institute of Medicine (IOM) under Tribhuvan University or by Kathmandu University to study medicine abroad. IOM has set a minimum standard of 50 percent for the MBBS. According to NMC, a total of 1,461 undergraduate students (MBBS/BDS) went to study medicine abroad in 2015, while the figure for 2014 is 1,379. A student going abroad to study undergraduate medicine has to pay around Rs 5 million while a student in Nepal pays Rs 3.5 million to Rs 10 million. 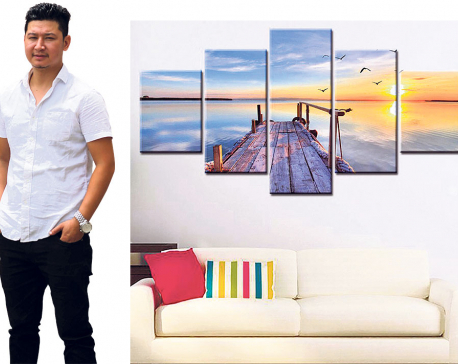 The official range is Rs 2.2 million to 3.8 million. There are 22 medical colleges including private ones across the country. Some 21,000 doctors are registered with NMC. Officials at NMC said some 2,200 students are enrolled in MBBS and BDS colleges inside the country.